Now that the Sandy recovery is in full gear and the city is starting to get moving again, you are probably starting to look for some activities to get this past week off your mind. 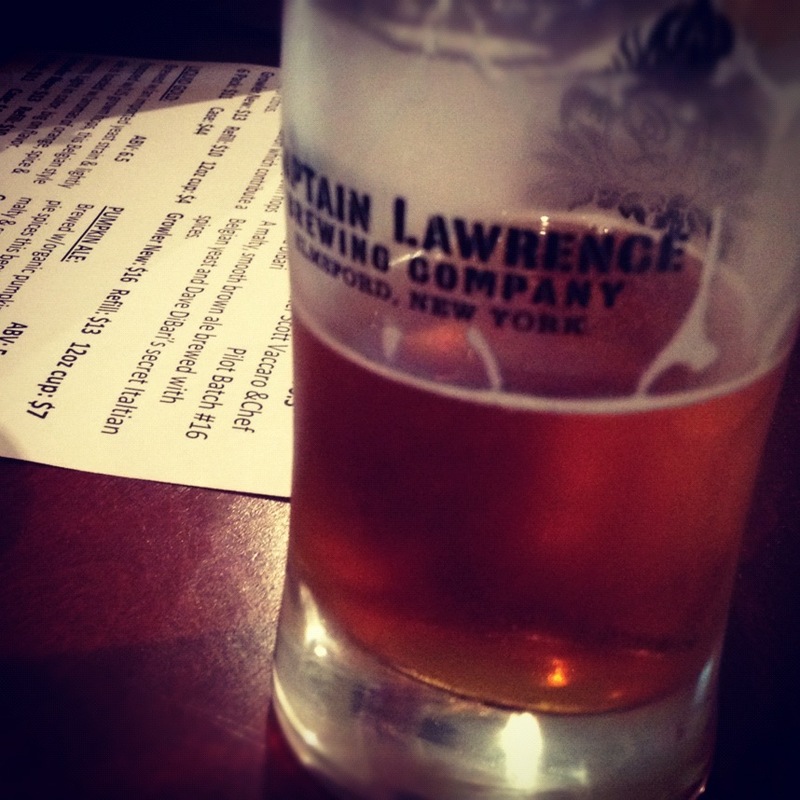 Well if you like beer and you like a little adventure, you have to get up to Captain Lawrence Brewing Company in Elmsford as soon as possible. Well these guys have their tasting room down to a science. For a $2 fee, you receive a 3 oz tasting glass (which of course you get to keep) and a menu to their ten beers on tap. 5 of these being their standard year round offerings (Kolsch, Liquid Gold, Pale Ale (Freshchester), Brown Ale, and the Imperial IPA) and the other five being their pilot batches looking to test run and fine tune. The tasting room is quite open with a handful of high tables set up. We were there almost immediately upon opening (cause we are anxious) and found an awesome spot to get settled. It may be getting a bit chilly, but these guys also have an amazing outdoor set up with a bocce court and picnic tables. Just one more reason we’ll be heading back seasonally. As for the beer itself, the tasting allows you to try each of those 10 beers twice. Yes, that’s 10 craft beers, at 3 oz a pop, twice. We didn’t even come close to finishing that as you can imagine but we did make it through the full list once with a few clear favorites leading the way. I have had the Captain Lawrence Liquid Gold before and it is indeed delicious. A crisp and full beer that tastes exceptional right out of their draft. Likewise their specialty pumpkin ale was an agreed upon favorite as the pumpkin flavor did not overpower or over-sweeten like so many of the bottled varieties out there today. My two personal favorites were their Dr. Brownski, a specialty brown ale that had great balance along with some serious complexity and the Imperial. I had expected the Imperial, being a high alcohol brew, to be heavy and more or less for show. So many breweries are making these alcohol bombs and it seems the flavor balance is an afterthought. But by using a very focused list of ingredients, the Imperial at Captain Lawrence manages to remain fresh and flavorful even with all that alcohol. Awesome stuff! Another reason that the day was so well spent is the tour and the interaction with the Captain Lawrence employees. Everyone seems genuinely excited about what it is they are doing and this really comes through in the tour. As opposed to a quick and boring walk-through, they are happy to have you up close and personal with their batching equipment and answer all the questions you can imagine. With a beer in hand, it’s still informal (the way a brewery tour should be) but seeing the scale-up a small brewery goes through as they expand production is pretty fascinating. Captain Lawrence has made its way into more and more restaurants and bars in the area and with more Northeast expansion coming, their supply is barely keeping up with demand. This of course is not the worst problem in the world to have for a young company! Otherwise, they run tastings based on the following schedule and for those folks in NYC without a car, the Metro North runs very close by and in fact that might be your best bet. Who needs to be worrying about driving when you have a tasting like this one available!